Let’s talk about dinner as a family today. I have said it so many times on here, but I think it is so important to kids and families. I know that people are busy, and kids are involved in so many different activities lately, and dinner seems to be one of the first things to go. Grabbing take out, everyone eating at different times, using the drive thru, and who knows how many other things to try to get everyone fed and where the need to be. I have a child involved in activities, my husband and I both work, I completely understand. But I remember sitting down with my family as a kid, and that was when we all shared and learned so much about what was going on. As a parent, I want to know what is happening in my kids life, and I want him to always be able to talk to me. Recently I read that the US ranks 33rd out of 35 countries in families sharing a meal together. That is just crazy!! Many studies have shown that sitting down together as a family gives kids and adults healthier eating habits, helps kids do better in school, and those kids are more emotionally stable. So carving out just a few minutes together is more important than ever, given all the craziness that is out there in the world. 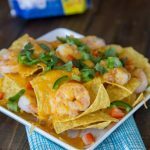 Today I am pairing up with SeaPak to bring you a Shrimptacular recipe, and help drive awareness to importance of family dinner time. 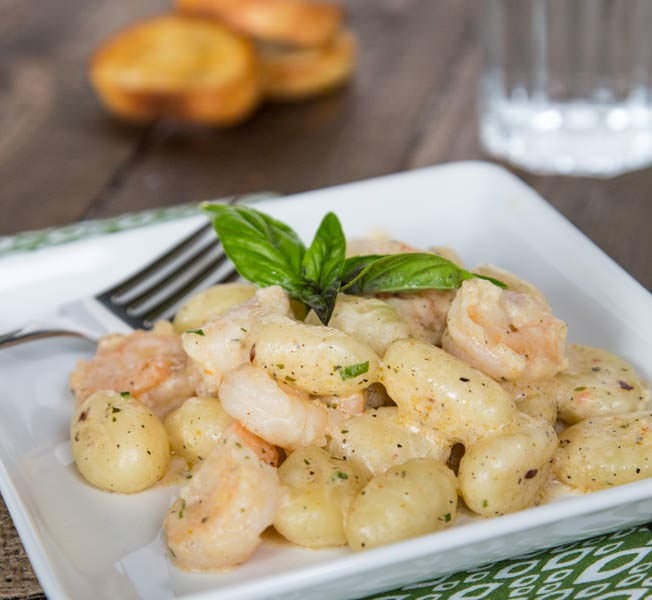 I made Gnocchi Shrimp Scampi, and let me tell you, it was insanely good. Plus, it only took 15 minutes to get it on the table. That is faster than any take out I have ever seen, and so much better than the drive thru! 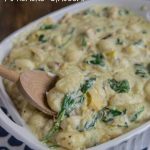 I started with SeaPak’s Shrimp Scampi, used some precooked gnocchi, added a few other pantry staples, and dinner was done. 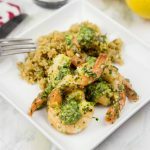 The shrimp scampi comes with all the seasonings and sauce frozen on the shrimp, and it adds so much flavor to the sauce. My family raved about this, I can not wait to make it again!! So take a little bit of time as a family, and make dinner fun! 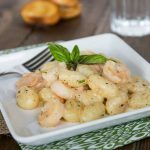 This gnocchi shrimp scampi is so quick and easy, but if tastes like something you would get at a restaurant. Get out the wine glasses, pour milk in them for the kids (the adults can feel free to have the real stuff). Just make it fun, and get everyone talking and sharing together. It does not have to take a lot of effort, really just getting out special glasses will make the kids think this is a special night, and they will be asking to do it again and again. To make dinner a little easier, there is a fun giveaway below!! Take the SeaPak quiz to see what your dinner style is, where you can also get coupons for products that match your cooking style. 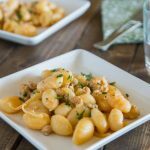 Use frozen shrimp scampi and gnocchi to make a super comforting dinner, ready in about 15 minutes. Heat a large skillet over medium high for 1 minute. 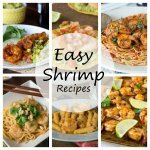 Add the shrimp to the pan, in a single layer. Saute for 6-7 minutes until the shrimp are starting to turn pink. 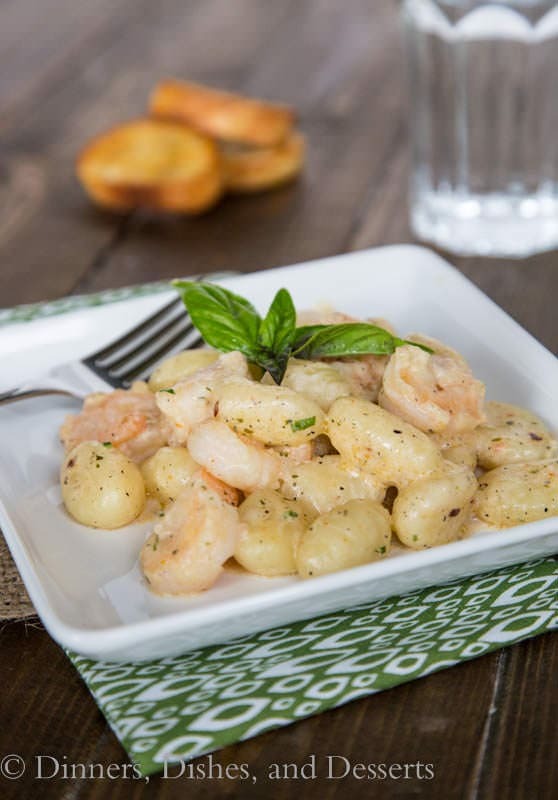 In a 1 cup measuring cup, combine half and half, Parmesan cheese, red pepper flakes, pepper, and basil. Add the half and half mixture to the shrimp. Stir to combine. Cook for 3-5 more minutes, until the mixture starts to simmer and the shrimp is cooked through. 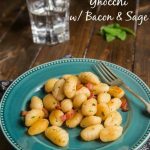 Toss together with gnocchi to serve. **This is a post was sponsored by SeaPak. All thought and opinions are 100% my own. Thank you for supporting the brands that I love. 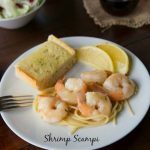 I love shrimp scampi and your recipe sounds delicious! 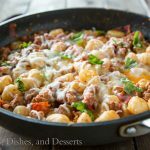 Love the addition of gnocchi! I think that meal time together is so very important! I can’t wait to make this for Thomas! What a fantastic idea! 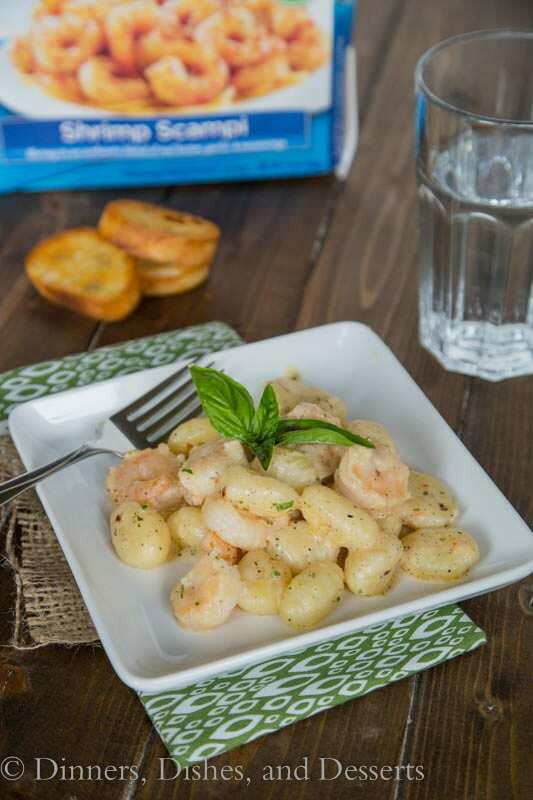 I love that you brought gnocchi into the scampi. 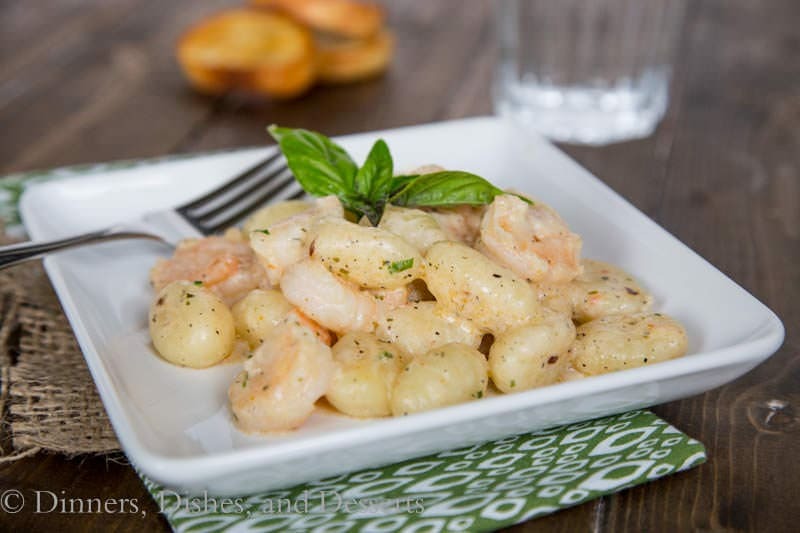 I love gnocchi, but have never paired it with shrimp. This sounds amazing! 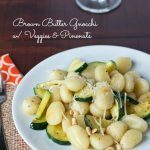 I haven’t had gnocchi in ages – that needs to change! This looks delicious! What a beautiful looking meal. 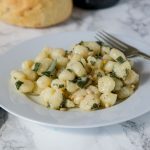 I found a great brand of gluten free gnocchi so I am excited to try this out. 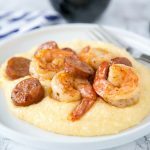 Such an easy and delicious recipe….I think I’ll be making it weekly.